The man who drowned in the Waitara River yesterday (30 July, 2015) was Erka Xu, aged 52, New Plymouth Police said. The victim was a Chinese national who was visiting friends in the New Plymouth area. He was fishing with a local whose identity has not been revealed. Bay of Plenty of Deaths. Rangimaria White, 14, was killed after she was struck by a vehicle on Goring Street in Opotiki shortly before 3.45am on Sunday, 27 July, police said. The vehicle failed to stop. Anyone with information should contact Whakatane Police on 07 308 5255 or anonymously via Crimestoppers on 0800 555111. RIP. Rangimaria Christine White. Described as a “star student”, the 14-year-old from Te Teko was killed in ‘hit-and-run’ on Sunday. Bay of Plenty of Deaths. The man killed in the crash on SH30 at Horohoro on Tuesday, 28 July has been named as Blair Amundsen, aged 35 from Kinleith. Mr Amundsen was killed when a logging truck lost control and collided with the ute he was driving. Police has confirmed that the two bodies found in the Kepler Track area are those of 23 year-old French Canadians, Louis-Vincent Lessard and Etienne Lemieux. Police will now work towards repatriating the two dead bodies to Montreal, Canada. At approximately 2:20am on 29 July a 2-car collision occurred at the intersection of Hope and Stafford Streets in Dunedin, said police. A Ford Laser containing 6 persons being driven along Hope Street has failed to give way and collided with a Ford Courier Utility being driven along Stafford Street. As a result of the crash an 18 year old female was rushed to Dunedin Public hospital in a critical condition. She died shortly after arrival. Shannon David Stewart, 40, was the victim of a fatal crash involving a motorcycle and a van on Pound Road near the intersection with Savills Road (Canterbury) around 5pm last night (26 July 2015). The victim of a fatal single-vehicle crash that occurred on Grahams Road near Tinwald at around 11pm on Friday 24 July 2015 has been named by the police. Terry Henry Munday was the driver and sole occupant of the vehicle that crashed, police said. The body of a missing South Otago man, Ian Mathieson, has been found in a paddock in Balclutha a week after he disappeared. A post mortem has revealed that a 42-year-old man involved in a fight at an Omapere address on Tuesday afternoon died of natural causes [!? Police say the person who was killed when an ambulance crashed in Northland was Sonny Rawhiti Kemp of Kaeo. Mr Kemp was a patient of St John in their care from early morning on 21 July and was being transported to hospital at the time. Canterbury Police say the victim of a fatal crash involving three vehicles on SH1 between Burnham and Dunsandel on Thursday afternoon (16 July 2015) was Anthony Newton from Ashburton. A second body was found earlier today in the search for 23-year-old French Canadian students, Louis-Vincent Lessard and Etienne Lemieux, police said. Search staff found the second body in the same area of the avalanche debris and both bodies have now been brought back to Te Anau for formal identification, according to the police . Both Louis-Vincent’s and Etienne’s families in Montreal have been advised of the latest development, said police. The body of a man has been located about 350m below the Kepler Track, after a pair of French Canadian tourists were reported as missing, police said. Louis-Vincent Lessard and Etienne Lemieuxboth, both aged 23, were reported overdue by family members yesterday. At about 4pm today (Sunday, 26th of July 2015), a body was located during an aerial search by police in an area between the Hanging Valley Hut and the Iris Burn Hut, according to a report. Louis-Vincent Lessard (left) and Etienne Lemieux , the 2 French Canadian tourists reported as missing, were both 23 yrs old, studying at Université de Montréal Industrial Design. They were last seen in Queenstown, New Zealand, on the 6th of July 2015. They left Canada for an outdoor adventure trip. The pair’s intention was to walk the Kepler Track in Fiordland National Park, one of New Zealand’s top tourist deathtraps. The Kepler Track is a 60-km circular tramping track near the town of Te Anau and passes through the Fiordland National Park in the Southland. It’s named after the German astronomer Johannes Kepler for no reason whatever. What happened to this Korean woman? Yoon Sook Chun, 47, is one of more than 500 foreigners missing in New Zealand. Mrs Chun was last seen on May 18, 2009, shortly before she left her Christchurch home. “Mrs Chun was last seen six years ago and over that time it is also possible that loyalties will have changed, or someone who hoped she would be found without them getting involved will step up and contact police. “We urge anyone who knows anything and hasn’t spoken to police before to come forward, so that police can decide whether the information is of importance to the investigation or not. The offer would be valid until October 1, police said. Blog moderators sincerely hope Mrs Chun, who is a mother of two, is still alive. However, the chances of that are pretty slim. Korean Tourist: Missing, Presumed Dead! Will the Missing Aussie Be Found Alive? Hundreds of kiwi kids are ending up in hospital poisoned every year, many after mistaking medicines for sweets, or experimenting with household chemicals. “Safekids Aotearoa has crunched the numbers on poisoning hospitalisations for children, showing that over eight years nearly 2500 have ended up in hospital after unintentionally poisoning themselves,” according to a report. Poisoning usually occurred at home, with children under five playing and experimenting with dangerous substances. Medicine accounted for about seven out of 10, with household chemicals, including toilet cleaner and dish-washing liquids, accounting for most of the rest, the report said. There were 11 Inflatable Worlds in New Zealand and two others with the same jousting arena, a report said. Accident Compensation Corporation (ACC) figures show there were 774 claims last year for accidents when “bouncy castle” or “inflatable” were listed in the accident description on the claim form. The claims cost ACC $234,517. Researchers studying hospital statistics found a 15-fold increase in wounds including broken bones, head injuries and cuts since 1995. Misbehaving adults and dodgy operators are being blamed for an alarming increase in the number of injuries on bouncy castles. Who killed Anne Marie Wanhalla? Don’t expect the thick blue line to solve this one! Police say the woman whose body was found in a Christchurch motel on Sunday morning was Anne Marie Wanhalla, aged 31. Her mysterious death at the Terra Vive Motels has been referred to the coroner and Canterbury police and Victim Support staff were working with Ms Wanhalla’s family as they come to terms with their loss, said a statement by the police. Meanwhile, police admit that they are clueless in the death of the Irishman who couldn’t swim but was found dead, fully-clothed in the Queen’s Wharf area of Wellington Harbour on July 5. Ihaka Paora Braxton Stokes, a 15-month-old Christchurch toddler suffered multiple blunt force injuries including broken bones, a post-mortem examination found. Police say he was the victim of a violent assault. However, his aunty claims the death was a “terrible tragic accident”. Football team shamed and expelled for cheating! New Zealand football team was expelled just hours before the final of the Oceania Olympic qualifying tournament because it was found to have fielded an ineligible player in the semi-finals, said the Oceania Football Confederation disciplinary committee (OFC). OFC on Saturday decided that South Africa-born defender Deklan Wynne was not eligible to play in the semi-finals, after Vanuatu protested their 0-2 loss, said Xinhua news agency. As a result, Vanuatu were awarded the victory and went on to the final, playing Fiji earlier today. “In accordance with Article 7 of the Regulations Governing the Application of the Statutes, a member of the New Zealand U-23 squad has been deemed ineligible to represent New Zealand,” the OFC said in a statement. Fiji’s under-23 beat Vanuatu 4-3 on penalties and advanced to next year’s Rio Olympics. The sinking of the Rainbow Warrior, codenamed Operation Satanic, was a special operation by the “action” branch of the French foreign intelligence services, the Direction Générale de la Sécurité Extérieure (DGSE), carried out on July 10, 1985. It aimed to sink the flagship of the Greenpeace fleet, the Rainbow Warrior, while she was docked in the port of Auckland, New Zealand, to prevent her from interfering in a nuclear test in Moruroa. Fernando Pereira, a photographer, drowned on the sinking ship. Two of the French agents were subsequently arrested by the New Zealand Police on passport fraud and immigration charges. Following questioning, they were subsequently charged with arson, conspiracy to commit arson, willful damage, and murder. As part of a plea bargain, they eventually pleaded guilty to manslaughter and were sentenced to ten years, of which they served just over two. A picture of the half sunken Rainbow Warrior . Image may be subject to copyright. See NZ Fair Use Notice. “. . . SIS failed to stop New Zealand’s only terrorist attack since the SIS began. This was the bombing of the Greenpeace ship Rainbow Warrior by the French Secret Service in Auckland harbour. One man – photographer Fernando Pereira – was killed. The SIS also failed to predict the Fiji coup of 1987. Where were the SIS skunks when the Rainbow Warrior was bombed? Did they materially assist the French government’s terror agents, or just looked the other way? Has a single SIS agent ever been prosecuted, dishonorably discharged, forced to retire, demoted, or otherwise disciplined for ‘failing’ to foil the the terrorist attack by the French government? Since the SIS proven role is that of “protecting” the elite against ordinary people, can it continue as a government unit, or should it be incorporated as a private mercenary force like Blackwater Inc? Xavier Maniguet: French Navy officer, expert diver, parachutist, acrobatic pilot, sailor, doctor specializing in diving injuries and aeronautical health, French Secret Service agent AND assassin. Photo: AFP. Source: Ouest France. Image may be subject to copyright. Xavier Maniguet, 62, one of a group of assassins who helped destroy Greenpeace ship the Rainbow Warrior was reportedly killed in a plane crash. Xavier Maniguet, also a flying instructor, was killed when his plane crashed in the French Alps near the resort of Saint-Sorlin-d’Arves. 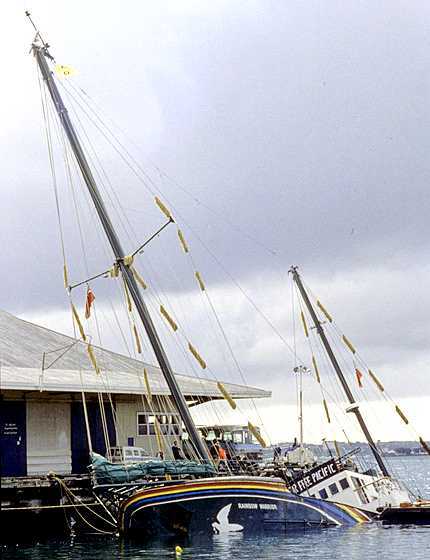 Greenpeace flagship the Rainbow Warrior was bombed in Auckland Harbor because it was campaigning against French nuclear testing in the South Pacific in 1985. Dutch-Portuguese photographer Fernando Pereira was killed in the blast on July 10, 1985. Thanks (!) to the NZ Security Intelligence Service (SIS), the French Secret Service bombing mission succeeded and Xavier Maniguet escaped without any problem. Two other French assassins, Dominique Prieur and Alain Mafart, were later jailed for 10 years for manslaughter; however, New Zealand government allowed them to walk free because the French government had threatened to expose the NZ SIS link in the Rainbow Warrior bombing, codenamed operation Satanic. Another Open Letter to New Zealand PM: Why are internal affairs of New Zealand dictated by Ottawa? The man whose body was found in Wellington Harbour has been identified as Finbarr CLABBY, 39. The victim was an Irishman who lived in Wellington, police said. Police reported that there were “no suspicious circumstances surrounding the death of Mr Clabby and the matter has been referred to the coroner,” which is the norm when a body is found in New Zealand. The victim of a fatal crash outside the Waikato’s Avantidrome has been identified as Belia Maria van Rensburg, who was a South African. Belia was killed when the car she was driving collided with a truck and trailer unit on a busy stretch of State Highway 1, between Hamilton and Cambridge on 2 July 2015, according to a report. The body of kayaker who fell into the ocean in rough conditions off the Bay of Plenty coast has been found by a friend, according to a report. Name of the victim has not yet been released. Cindy Tangipurunga George, 31, and her three kids – daughter, Pio Scarlet Jetejura Raukete, 5, and her sons, Teuruaa Junior George, 3, and Telyzshaun Gordon Ricardo Nelder Kruz George, 2 – could have been dead for up to a week before they were found, police said. RIP. Cindy George and her three children, Teuruaa, Telyzshaun and Pio. Source: unknown/ via stuff.nz. Police allege that Ms. George and her children died from the fumes of a car left running in a garage to keep the battery “ticking over”. Hudson Garratt, 67, was stabbed to death at his home in the Wellington suburb of Johnsonville on Wednesday night (1 July 2015). The 25 year-old female attacker also stabbed four other people, including a 9-year-old boy and a neighbour, police said. Read the story. RIP. Hudson Garratt. He was a beloved husband, father, grandfather and brother. Photo supplied/ via NZ police. The 27-year-old Oamaru woman was killed in a crash off State Highway 1, near Hampden, just after 12am on Friday (3 July 2015). RIP. Ema Louise McGeown, 27, was a “talented footballer,” said her friends. Sophie Langston, 28, was killed when the car she and her partner were traveling in collided with another vehicle south of Turangi about 1pm on Tuesday (30 June 2015). The couple were returning home to Auckland from the funeral of an older half-sister’s mother. RIP. Sophie, left, and her twin sister Laura. Police are in the process of contacting next of kin. Police say they have now formally charged a 22 year-old man with murder in relation to the death of Vicki Lee Warrington at a Waldronville address in Dunedin. Bruce Andrew Mortimer, a 46 year-old Nelson man, died in hospital after a serious assault in the early hours of Saturday morning at Franklyn Village in Nelson. The victim who suffered a serious head injury in the incident had been transferred to Wellington Hospital where he died. The investigation into the incident is now a homicide inquiry, police said. A female “gossip columnist,” who works for a shabby news outlet, has mocked the death of the Cook Islands family, Cindy George and her three children in Ashburton as “natural selection”. The Ashburton tragedy, whether it was foul play, or an accidental disaster, had nothing to do with natural selection, other than in the diary of a racist scumbag. Take the 2.98 million foreign visitors who arrived in New Zealand in the year ended May 2015 (www.med.govt.nz/). Yet, they keep on arriving, year after year! Now, that’s natural selection working at its best. Cindy George and her three young children, Pio Scarlet Jetejura Raukete, 5, Teuruaa Junior George, 3 and 2-year-old Telyzshaun Gordon Ricardo Nelder Kruz George were found dead in a house on Thomson St, Ashburton, police said. “She would have been 32 this year, we are the same age. She was my best friend at kindy and through primary school,” said a friend of the victim. Police are treating the deaths as accidental, District Commander John Price said, adding that police believed that gas caused the deaths. “A car was believed to have been running in a garage with internal access to the house, he said – that door was open when police arrived at the scene,” according to a report. It’s not known who left the car running in the garage, or why the internal door to the garage was left open. Would you buy this story? Is it any wonder that no one ever believes the police in NZ? Speaking about “democracy” and “freedom of expression” in New Zealand, a blog contributor said: ” Democracy? Freedom of expression? If kiwis were blind, they’d [still] be called hawkeyes! If the suicide toll in the country broke all previous records, [Fort] New Zealand would still be among the happiest countries in the world—ranking 9th, to be exact! “The provisional suicide toll has risen to its highest figure since the coroner’s office started releasing the statistics,” according to a report. For the year June 2014- May 2015, at least 569 people died by suicide or suspected suicide, says the stats, compared to 529 last year. And as for the happiest country bit? The Indian man who was killed in a crash on the Papakura – Clevedon Rd near Clevedon last Thursday (25 June 2015) was Shaan Singh. “We are… interested in hearing from anyone who has any knowledge of the crash or Shaan’s movements leading up to the crash,” said a police spokesperson reluctantly. The young woman who died last week when her vehicle collided with a school bus has been named as 28-year-old Charlotte Christina Armstrong. The victim was driving her car towards Christchurch on State Highway 75 Christchurch-Akaroa Rd shortly after 7.30am when the collision occurred while crossing McQueens Bridge at Gebbies Valley. One woman was killed in a two-vehicle crash on SH1 between Rangipo and Turangi, Bay of Plenty of deaths on Tuesday, 30 June 2015. “The crash occurred at approximately 1pm. It appears that the two vehicles collided as one attempted to turn right from the highway into a driveway,” police said. The fatal crash occurred at about 12.45pm on Sunday, 26 June 20115. One person was killed and four others also stabbed in Johnsonville, Wellington, police said. “The body of a man found dead at an address in Jellicoe St, Panmure, this morning will be removed from the scene this evening and will undergo post-mortem examination tomorrow. A 35 year-old Balmoral man has been arrested,” police said.